Howdy! My name is Flat Stanley, and I come from Austin, Texas – where I live with Karl, having being created by Riya as part of the Flat Stanley Literacy Project. 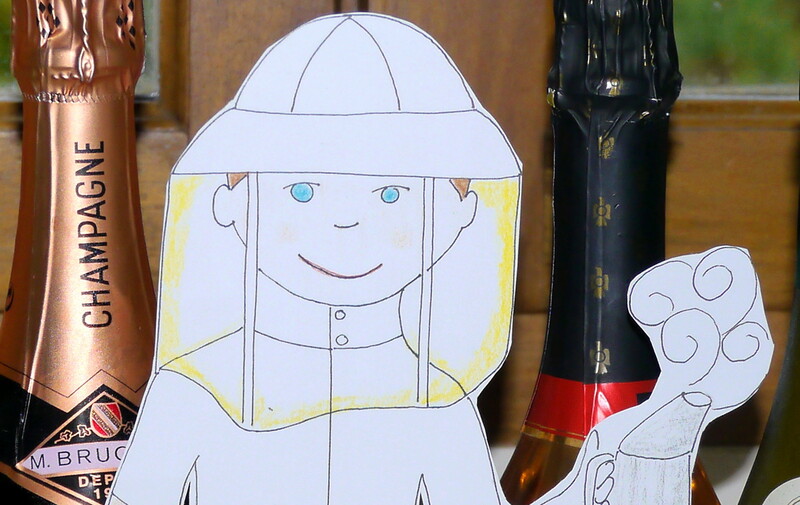 Flat Stanley has a penchant for fine French champagne. My dream is to travel the globe and learn about beekeeping in different countries. When I heard I was to visit Dallas, I thought fine, not terribly far (about 200 miles from Austin) and certainly not as historical as London, England or seasidey as the Isle of Wight (England’s smallest county at high tide). However, it turns out that this Dallas is a Person, and I arrived after a stress-free journey in a small farming village in south-west France. Being something of a connoisseur of fine wines, this is rather a coup (notice how I am already picking up some French vocabulary). After a short siesta, we went off to have a look at the bees’ foraging grounds, which at this time of year means sunflowers, sunflowers and sunflowers. This means that the honey from Dallas’ bees will be a monofloral honey. Last year it was a fabulous rich sunny yellow, and looks like it is packed with solar energy. It crystallises rapidly, has a creamy consistency and is rich in calcium, boron and silicon. In France, sunflower honey (or miel de tournesol as I now call it) is top of the leaderboard in terms of production. Sunflowers are originally from North America (just like me), and were cultivated by the native Americans. They were brought to Europe in the sixteenth century by the Spanish, and cultivated for the oil from the seeds. We also visited an alfalfa field – which last week, apparently, was buzzing with bees, but was now eerily quiet. 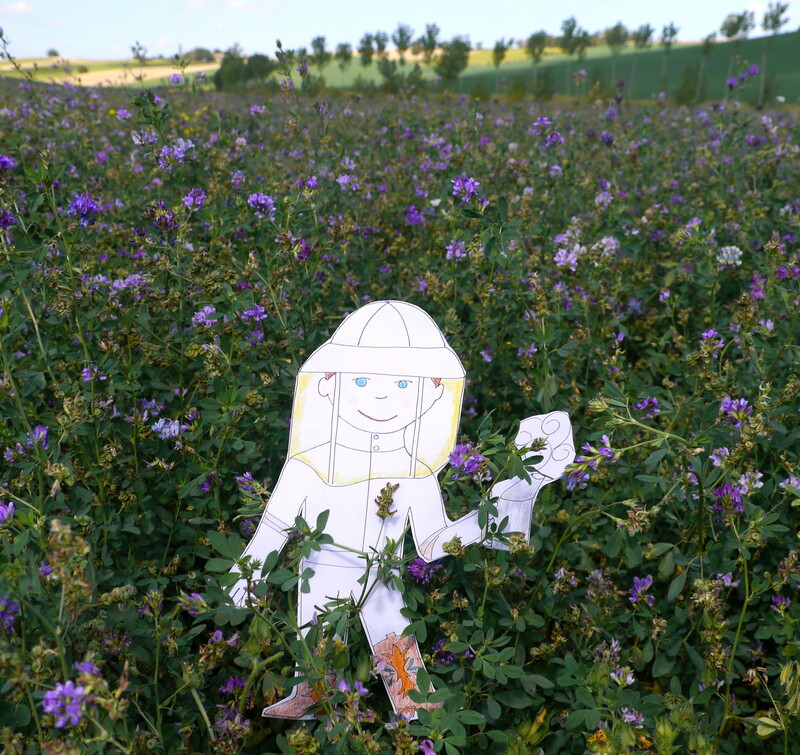 Alfalfa honey is big in the United States and Canada, but Dallas says she hasn’t noticed it much in evidence in France. Yet. The honey extraction is scheduled for September 7th. Karl, can I stay here please to help with that? Fantastic! Will be pretty hard to top the champagne and swimming pool. Flat Stanley does seems to be something of a bon viveur, and knows what he likes – Assam tea & clotted cream with you. Champagne with me, a decent Burgundy will do too, apparently. I just hope that the cellar (some Ikea racks in the hall) is sufficiently well stocked for him. Hope he’s not visiting the bees after all that sozzling! We are going to see the bees tomorrow, when it will be sunnier. I am told its just water with tonight’s meal. I have asked for finest Evian, but have been told to expect it from the tap. FS. With all the wonderful treatment Flat Stanley is getting, he may not want to come back to Austin. His itinerary has him in Australia next, but I feel if you are in the south of France, you might as well stay awhile and enjoy the sights and sounds (and wines). Plus it is still technically winter in Australia so staying for the honey harvest sounds like a fantastic idea. 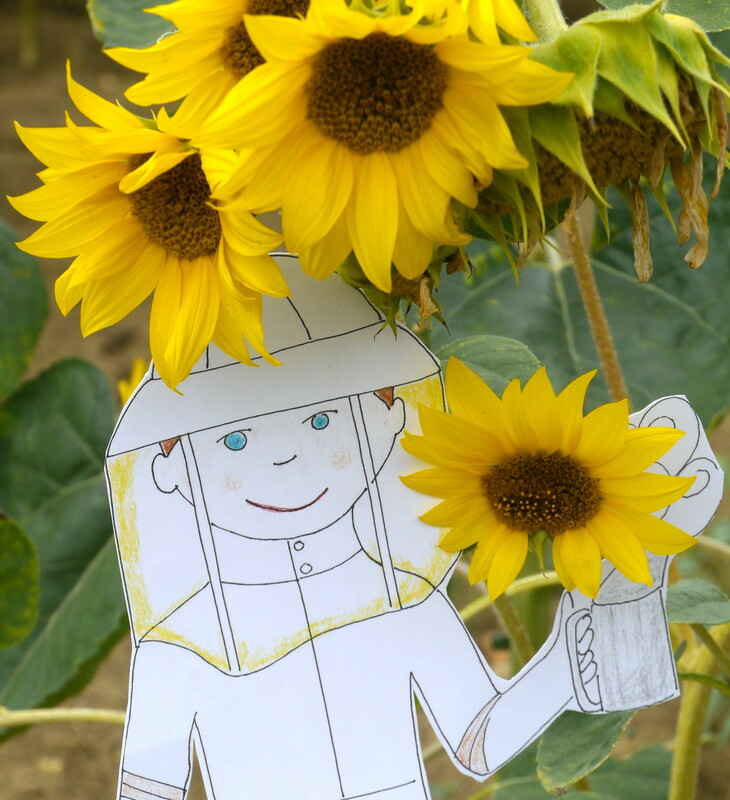 Flat Stanley is certainly enjoying himself as he visits beekeepers from around the world! Oh, that’s me, I’m next. I’d better start thinking about what to show FS (see, I’ve already got a nickname picked out for him) on the farm. 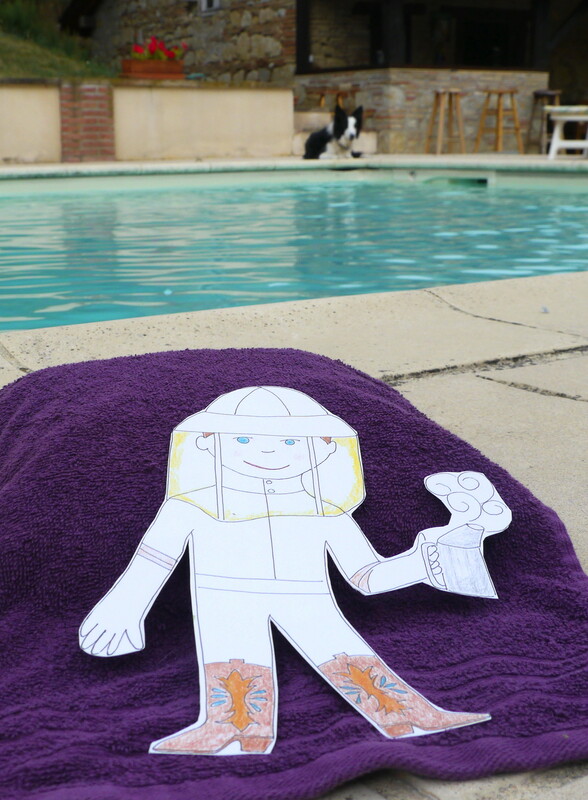 He’s being spoiled by the pool in France so I’m not even going to try to offer him more luxury – this will have to be a working visit!